Professional wrestling and Greek tragedy may appear to be strange bedfellows. When Aeschylus was facing off against a rival playwright for the golden laurels, surely he never imagined bouncing his opponent off the ring ropes, leg-whipping him to the canvas, and then extracting submission and sweet victory from the pain-riddled victim with a Figure Four Leglock. Nevertheless, one of the major schools of classical drama is the downfall of the beloved hero, and here's where pro wrestling and Greek tragedy intertwine in the DNA of the Modern Day Warrior, Kerry Von Erich  the late, great Achilles of the Texas wrestling ring. The Von Erich Wrestling Dynasty that peaked in Dallas in the late '70s was the product of Jack Adkisson, a strongman athlete who in the 1950s donned a Kaiser helmet and declared himself to be Fritz Von Erich, the villainous sauerkraut on the frank 'n' beans circuit of underworld wrestling. A showbiz innovator whose style prefigured the mystery powers of 1970s Kung Fu movies, Fritz blitzkrieged his opponents with the ferocious Iron Claw, a temple-crushing submission hold that instantly vaporized all enemy resistance. Hundreds of Fritz's unfortunate opponents crumbled like the Maginot Line under the Claw's awesome, some said supernatural, power. Year after year everyday folks lined up in droves to fork out their greenbacks and heckle this goose-stepping fascist evildoer. T hen in the late 70's, as his sons grew old enough to break into the family business, Fritz's image changed dramatically. 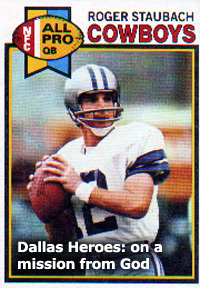 The offspring kept the Von Erich name, but buried the Kaiser helmet for a family image more in line with the silver hat of #12, Dallas Cowboy immortal QB Roger Staubach. Unfortunately the hard-wrestling, hard-partying Von Erich brothers also shared some of the same self-destructive appetites as the notorious #56, Thomas "Hollywood" Henderson. But at the time nobody had a clue about that. They just knew these boys were wild men. 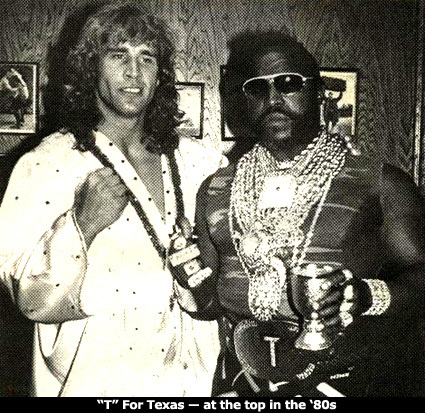 It didn't take long after fans got a gander at these fired-up young grapplers, their rock and roll hair and their ripped physiques for the Von Erich name became a source of "state-riotic" pride for Texans. This ascension was engineered mostly by Fritz's vision of what TV could do for wrestling and by his formation of the World Class Championship Wrestling league, in which his sons were the main draw. At its height, WCCW was seen in 66 U.S. television markets, Japan, Argentina, and countries in the Middle East. First to claim his father's mantle was 6' 2", 220-pound Kevin in 1976. Soon to follow was 6' 6", 235-pound David. Then in 1979, the 6' 3", 255-pound Modern Day Warrior, Kerry, made his debut. The three would go on to win about every Championship Belt there was to win in the heavyweight, tag-team, and three man tag-team divisions. 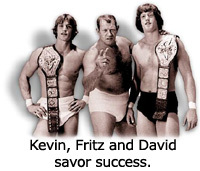 In time Chris and Mike Von Erich would join the fold, but it's the original trio of Kevin, Kerry, and David that formed the monumental pyramid of league popularity that would eventually be gobbled up by Vince McMahon's McWrestling empire. Inside this triad, as soon as he turned pro, it was Kerry who captured the most attention. 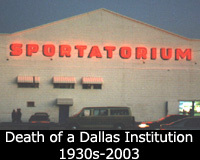 Fans flocked to watch the brothers wherever they wrestled, whether it be at Dallas's dilapidated yet venerated Sportatorium, or a Rotary Club show in a high school gym in Mount Pleasant, Corsicana, or Longview. From the first instant Kerry's entrance theme, "Today's Tom Sawyer," launched out of the PA, wrasslin' Beatlemania was sure to strike. 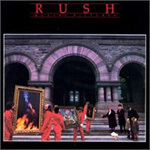 Thanks to Kerry and the woozy sci-fi idealism of Canadian power trio Rush, youth power had taken hold in a sport that was once the reserve of winos, fugitives, old timers and bowery bums. It was electric. With good reason. 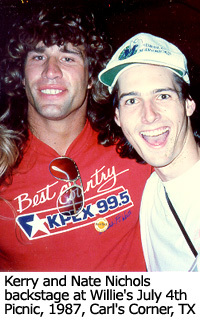 If during the Carter years you were to create from scratch a futuristic new prototype of professional wrestler, he would be young, wild and possess the insanely cut, "He-Man, Master of the Universe" build of Kerry Von Erich (He-Man actually capitalized later on the very look Kerry brought to the public eye). From the buzz-cut, barrel-bodied brawler Fritz to the Absolom-maned V-cut torso of Kerry, pro wrestling had been reformed. 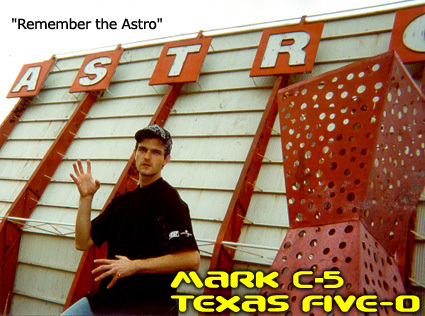 At the vanguard was a local phenom coming into his own, his heroic setbacks and vindications painted across Texas and the world on grainy Philco TV sets that required pliers to change the channels. Saturday night UHF exposure further fueled the fans who followed Today's Tom Sawyer from venue to venue. When Kerry vaulted into the ring in his white boots, brown-blond mane flying wild, flash cubes popped in a chorus of hormonal excitement. Grandmothers and little kids alike knew the chant that preceded the ritual power chords: "Today's Tom Sawyer, Mean, Mean, Pride." So strong was his bond with his public, that it was often only the exhortations of the fans that revived Kerry from the effects of many a deadly Sleeper Hold. It had to be the fans that did it, didn't you see that Kerry was unresponsive the first two times the ref lifted his hand and it dropped lifelessly to the canvas? If Kerry's hand had drooped to the canvas for the third time, he would have been immediately disqualified! Get up, Kerry, GET UP!!! Wait, his hand is moving, he's not DQ'd... and now he's making his way to his feet, amazing... Rick Flair or Kamala the Ugandan Giant or the Great Kabuki or one of the Freebirds is looking really scared now, (NO ONE'S EVER BROKEN THE SLEEPER), looking around like jerks screaming at the crowd to shut up... but Kerry is now back on his feet  after being so close to losing moments ago!  and now he's broken free! He's fired up for payback! Incredible! After hurling his opponent to the ropes and connecting with a devastating Discus Punch, it's a small matter for Kerry to cover his semi-conscious opponent for the three count and the victory. The crowd dissipates into the cold Texas night, exhausted but fulfilled. Sure, the Greeks might have had loftier plots in their dramas, but history doesn't record anything about the audience screaming like crazy at the actors during their performances, and actors threatening to come out into the audience and thrash the hecklers with folding chairs! The triad dominated the sport through the early '80s. Still, despite the career success, name recognition, financial security, and popular adulation, life away from the cameras was less generous for the Adkisson family. It even seemed that like many of history's greatest warriors  Alexander of Macedonia, Abe Lincoln, Bruce Lee  inside the flame of destiny was revealed the red-hot iron of a curse. In the case of Fritz's boys, now the true embodiment of wild and talented Texas youth, it was family curse, a tragic one, and a relentless one. Back in 1959, Jack Jr. died after being electrocuted at the family ranch. In 1984, David, age 25, stunned the wrestling community when he was found dead in his Japanese hotel room. While the original cause was attributed to an intestinal disorder, there have since been reports indicating drugs contributed to his death. A wrestling-fest at Texas Stadium dedicated to David drew some 40,000 fans. Mike Von Erich stepped forward to fill the shoes left by David, but in 1987, Mike contracted Toxic Shock Syndrome after undergoing surgery to repair tendons in his arm. Though he survived the bout with Toxic Shock, Mike, age 23, would commit suicide later that year by overdosing on tranquilizers. 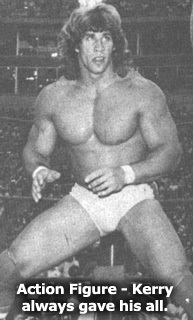 Chris Von Erich replaced Mike, but his size (5'6", 160 pounds) hampered his wrestling career. In 1991 at age 21, he shot himself, with fatal results. As he buried his brothers one by one, Kerry was subject to uncanny bedevilment all his own. In 1986, he was involved in a serious motorcycle accident, which badly dislocated his hip and caused the amputation of his foot. Amazingly, he continued to wrestle with the use of a prosthetic replacement  a bionic foot  and succeeded in unifying the WCCW and AWA Heavyweight titles before moving to the World Wresting Federation in 1990. In the WWF, the now-titled "Texas Tornado" defeated Mr. Perfect to claim the Intercontinental Heavyweight Championship. The belt was his  the peak of his career, it's true, but at a price. By now, Kerry was heavily addicted to painkillers, performing spectacularly for the public he served, only to suffer the repercussions after the bout. In 1992, he was arrested for forging prescriptions for both Valium and the painkiller Vicodin. He pleaded No Contest and was placed on ten years probation. The following year, he was again arrested, this time for possession of cocaine. Since he was already on probation, Kerry was looking at serious jail time. On the morning of February 18th, 1993  the day he was to be arraigned on his cocaine charge  Kerry drove to the family ranch, took a .44 caliber Magnum and an old Jeep, found a quiet spot on his father's land near Denton, Texas, and shot himself through the heart. He was 33. Though all the Von Erichs attained incredible popularity, Kerry was the main draw, very much the heart of Fritz's wrestling empire. After Kerry's death, the empire was no more. Kevin quietly retired to ranching, the lone surviving Von Erich brother of his generation. Fritz died of cancer on Sept. 10th, 1997. Of his generation of wrestling heroes, it was Kerry who climbed and fell the furthest. In high school, he broke the junior world record for the discus. At Southern Methodist University, he broke the school's discus record held by one Jack Adkisson  none other than his own father. 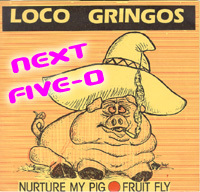 He was a likely discus candidate for the 1980 Olympics, until the boycott short-circuited that goal. He went from outstanding Olympic hopeful to forging prescriptions for Vicodin. Nevertheless Kerry was born to be a hero. He killed himself because he couldn't stand to be recast as the villain, the jailbird, the loser, the town disgrace. His fall was tragic, but it had the ring of fate, or perhaps genetics, in a uniquely talented but troubled bloodline. An eternity seems to have passed in the last decade, but one thing's certain. No one who witnessed the Modern Day Warrior in action will ever forget him.